I really like this simple design of the can and the logo. And well I also tried of some new technique with product photography and they both came out pretty well. Both are sportdrinks but not from a company that you expect to be producing any beverages. PeptoPro is a part of a famous Chemical plant called DSM which does many researches in chemical and pharmaceuticals. 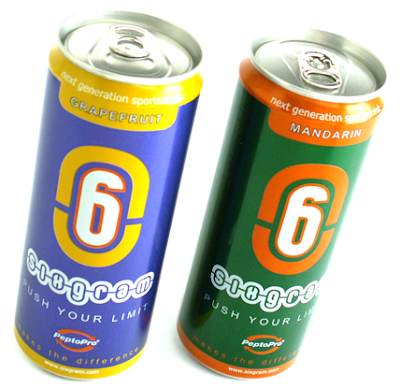 This year they are sponsoring the Olympic games and made these sportdrinks for the atletes. They are not Red Bull types of sportdrink more kind of Aquarius. However the taste of both of them are horrible. I donno who tested the taste but he probably been effected by the other chemicals they were testing. 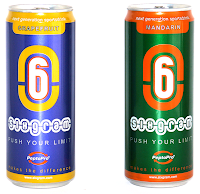 For sure you taste mandarin and grapefruit but not really how its should taste though. It is very bitter and kinda taste slightly better when it is ice cold. But wouldn't want to buy it ever again, it is like drinking some medicine then some refreshment after or during sports. The can have a bigger opening then a normal can, probably so you can throw it faster down your throth befor any of it hits your taste buds. I really love the simple easy design, but what does that 6gram stand for? On the whole cannister there is totally nothing that says 6 grams. I had to search their website and only 1 sentence of a very long story it says: "6g of protein". Not that really special could gone for any protein shake that taste better than this. For overal design looks an 9, I love the looks but the PeptoPro logo kinda killed it. Looks more like a recycling logo than having to do with any sports. Taste is gotta be 1 , just horrible wouldn't even consider to drink it when some one offer is for free on a very sunny day. I would kindly decline. Ok it is an Olympic drink , but I rather go for the drink that Aquarius give if I was an athlete cause they are partners too.